We emerged from the jungle after a three hour slog to find ourselves atop a rocky, wind-battered headland high above the sea. To the south lay the open ocean; a vast, heaving, ultramarine mass. Waves were rolling towards the beach where a reef lurked, ready to play havoc with their symmetry. 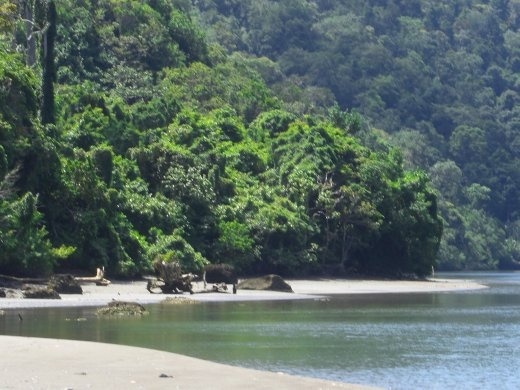 To the immediate east the pristine water of a river estuary, emerged from beneath the green wall of jungle. Flowing swiftly, 100 metres wide, it lapped against the base of the headland: our way east was blocked. Behind us, and to the west, lay the jungle we had just traversed. My heart sank. After crossing waist-deep creeks, scrambling up and down slippery spurs and picking our way through the jungle, there was no way forward. We were finished. A host of thoughts and emotions erupted. I was angry, disappointed, and suspicious. Why had I undertaken this adventure on a whim? Why try something when so ill-prepared? Why trust the word of someone I’d just met by chance? Or maybe I’d been duped? Maybe there was no short-cut to this village? Maybe the village didn’t even exist! And now I’d have to back track three hours. And then I’d have to find transport back to Maluk. What a mess! My dismay was palpable. “That’s it then. Journey over. We can’t cross that!” I said, pointing angrily at the river. Ali seemed unconcerned. “Be patient,” he said. “We must wait. In an hour the tide will drop. Then we’ll be able to cross. I began to inquire about getting a ride and I was put in touch with John. He lived in a village near the south coast, was going home on leave and was willing to take me along. I could ask about further transport to Lunyuk when he dropped me off. So it was arranged: John would pick me up at daylight the next day. Around 6.00am John pulled up. I was ready. He secured my pack and we set off. Traffic was sparse but the road was rough. There were many potholes, especially on the inclines and declines, and we zig-zagged between them at snail’s pace. After 15 minutes the bitumen ended and the gravel began. Being dry season it was firm and we fairly zinged along. There were no kampongs. We saw the occasional rough shack, its occupants somehow scratching a living from the wilderness. We passed through Sekongkan Atas then turned right to detour to Sekongkan Bawah, a small village by the sea on a pretty bay. After a quick smoke for John and a stretch of the legs for me, we set off again. The countryside was rugged and spectacular. We travelled through primary jungle, the steep hillsides festooned in greenery. Occasionally we saw gangs of macaques moving along the road. Most fled as soon as they saw us but the alpha males often managed a malevolent stare as we cruised past. We saw some very large lizards lumbering along, poor man’s Komodo Dragon-style, and one brilliantly coloured, banded snake. Apart from the wildlife, we had the road to ourselves. It clung to the hillside following the contours. Little gullies were bridged by neatly-wrought stonework and our progress was shaded by stands of teak and kapok trees. Below us, and to the left, we spotted the giant pipe that deposited waste from Newmont's copper and gold mine out to sea; the tailings were disgorged about 1.5 km offshore. I wondered how thoroughly treated they were. Eventually the road descended taking us closer to a rendezvous with the pipe and we crossed over the top of it at a tee-intersection – we had arrived in Tongo. We bought some fuel and took a break before continuing the journey along a rutted, dusty track that ran parallel to the coast. It was scrubby, salt-blasted country and the sun was beginning to bite even though it was still early. I was relieved when we turned inland again and entered the forest. Another thirty minute’s riding saw us reach a hamlet. We stopped adjacent a cluster of neat houses, their gardens alive with multi-coloured bougainvilleas. Almost immediately, a teenager about 17 approached and asked us what was up. He listened carefully as I explained my plan. We talked. It was a 9-10 hour walk. We would be lucky to make it before nightfall. I only had six bananas and 2 litres of water. Ali, for that was his name, assured me that he did not need food and that we could get water from the rivers. “Well,” I thought, “you wanted an adventure - this is your chance!” Ali and I reached an agreement. I paid John and wished him all the best. We watched him wheel around on his motorbike and tear off down the track - he hadn't been home for a month. Ali stepped into the jungle. I followed – but to where? We entered a gloomy, silent world. The air was dank and steamy. Scant rays penetrated the thick canopy. A myriad of plants grew on the forest floor, each reaching up for its share of the available light. Ali walked swiftly. There was no visible track. I wondered how he knew the way. I looked carefully. Every so often a sapling had been cut off about a metre above the ground. This pointed the way as it twisted and turned, rose and fell. We scrambled up steep inclines, grabbing vines to pull ourselves up. It was hot, sweaty, hard, work. We pressed on. We descended into a valley and came to a shallow creek. I took off my shoes and waded across. Ali pointed out the rocks on the far bank. Shaded by over hanging bushes they were covered by millions of, baby shrimp each about 10 mm long. I had never seen anything like it in my life. We pushed on and reached a muddy river. This time the water was waist deep. We took off our trousers and waded across. On the far bank, we stopped for a rest, a banana and a drink. Ali set off again carefully choosing his foot falls. I lived in the now, concentrating on keeping three points in touch with the cliff at all times. I didn’t look down. It took about three minutes to reach the safety of the rock shelf. Ali was laughing at the look of relief on my face. It felt good to be out of danger. We picked our way around the bottom of the cliff via a narrow rocky path. The breaking waves showered us with spray. The big wide river was emptying itself into the sea. It looked very deep. We found a sheltered spot and waited. It was after midday; time for sohur. Ali performed his ablutions, took himself off to one side and prayed. I wondered if he was praying for our deliverance. It did not seem a good sign. When he finished we had a sip of water, shared a banana and waited. The tide receded to expose more and more of a rock anchored in mid-stream. Ali jumped in to check the water’s depth. He called out to me but his voice was whisked away by the wind. He returned and we waited some more. Thirty minutes later Ali plunged in again. He swam across as it was still too deep for him to walk but he reckoned I could make it. I put my camera into a plastic bag and tied it tight. I stripped off and hauled my backpack and daypack on to my head. I waded in. Pretty soon the water was up to my armpits. I shuffled forward another twenty metres: so far, so good. Twenty more and the level began dropping. I was on my way out. A big smile spread across my face. Ali was laughing. “Can you handle it?” he inquired. I made it up the bank and wondered what the next hurdle would be. The sun was beating down as we dried ourselves after the river crossing. We were thirsty. We took a sip of our precious water. Ali had been wrong about being able to fill up from the rivers. The water, so close to the sea, was salty. There was nothing we could do except press on and ration our supply. We faced a long beach which stretched for miles before disappearing against the base of a rocky outcrop. We trudged on. The sand, yellow, coarse and yielding made each step an effort. My shoes began to fill with sand. I stopped to shake it out. Blisters would have spelt the end of me. Ali could see I was struggling – he was too. “Don’t worry,” he said. “No more rivers. Just walk.” I felt guilty about doubting him before. He was a good kid – tough and brave. We soldiered on rationing our water strictly. To the right waves broke ceaselessly over the reef. An occasional seabird circled overhead, its lonely cries struggling to be heard over the din of the breakers. I felt as if I was far, far away from all that I knew and from all who knew me. We didn’t talk. We just kept putting one foot in front of the other. We never saw a soul. Hour after hour we trudged along stopping occasionally to rest, change over back packs and take a sip of our precious water; we were down to our last litre. Around 3.00pm the beach ended. We were confronted by a rocky headland around which we had to clamber. The rocks were jagged and sharp so any mishap was guaranteed to end in gashed skin and lots of claret. We picked our way using great care. At times we had to climb high above the sea - I’m not that fond of heights. We clambered back down onto another beach and began sand-slogging again. I could feel cramp lurking just waiting to pounce. I took each step carefully. Steady, steady, I tramped, occasionally looking across at Ali, his face a mask of quiet determination. Around four the beach ended. We climbed a sand dune. At the top it levelled out into thick scrub. We followed a faint track. Ahead of us we could see what looked like cultivation. Sure enough we came to fields of corn, cassava and bananas. We were nearing our destination – the village of SP3. It wasn’t long before we saw our first house - a hut made of woven bamboo strips with an alang-alang roof . A few minutes later we arrived in SP3. We saw a warung selling bottled water. We headed straight for it and slaked the thirst which had dogged us as we trudged that lonely coast. The feel of that cool, smooth water as it slid down our gullets was sheer bliss. The women and children who had gathered to witness our arrival looked on bemused as we guzzled it down. Ali bade me farewell and made his way to his uncle’s house. I found myself in the company of a buxom matron whose family owned the only motorbike in the village. She demanded an outrageous sum for the trip to Lunyuk and refused to haggle. “That’s my final price” she kept repeating. Then she said something that got my back up. So, I bought 4 litres of water and a couple of packets of biscuits and hit the road. I hadn’t gone too far when I began to think that maybe I’d been a bit hasty. I’d just walked nine, tough hours on a few bananas, battling thirst all the way. It would soon be dark, I had to find a place to sleep and severe cramp was lurking. Beyond the last houses the road became a track, increasingly rocky and uneven. Although very tired I felt I could keep walking as long as the going was level. But as soon as the track rose or fell the cramp would stir in the calves or quads. I massaged my legs vigorously and drank as much water as I dared. But I couldn’t keep the cramps at bay. I started walking backwards up the inclines but it was hopeless – I just had to stop soon. Darkness was descending. Fortunately it wasn’t long before I found what I was looking for – an area of flat ground sheltered by some low bushes. I took my backpack off and began to pull out a ground sheet. Just as I did so I heard the unmistakable roar of an engine being borne on the wind from the valley below; minute by minute it came closer. And then it appeared – the most beaten-up, rust-riddled 3-tonner I’d ever seen. It was held together with fencing wire and had no windscreen. The driver, Will, greeted me cheerily and offered to take me to Lunyuk but warned we wouldn’t get there before midnight as he, and his crew, had to pick up produce from farms on the way. Needless to say I climbed up into the cab and was immediately gripped with the most incredible cramps in both legs. I was screaming in agony. Will must have wondered what had hit him! Eventually with his help I was able to unlock my legs. I stuck them out front where the windscreen should have been and lay back totally drained. For the next couple of hours Will treated me to a fantastic display of off-road driving as he piloted that old truck across washaways, up and down gullies and through rocky stream beds. In the black of night we raced from farm to farm picking up sacks of padi and corn and hands of bananas. Around 10 we stopped at a mill in a village called Sukamaju to unload the padi. After that the next thing I remember is being woken up. We had arrived at Will’s house. I was ushered inside to meet his wife and son. Food was ready and the entire crew tucked in – it had been a long night. Will showed me a vacant bed and I crashed. I slept the sleep of ten men and when I woke next morning I felt rested and sore but very satisfied. I showered and had breakfast with the family. Will’s crew were still sleeping off the previous night’s exertions.